So it's Organic September and you may be thinking, why should I go organic, what does it do for me? Well the correct question you should be asking is what does it do for 'us' - as in the whole population, the animals and the people and the earth as an entity of it's own. 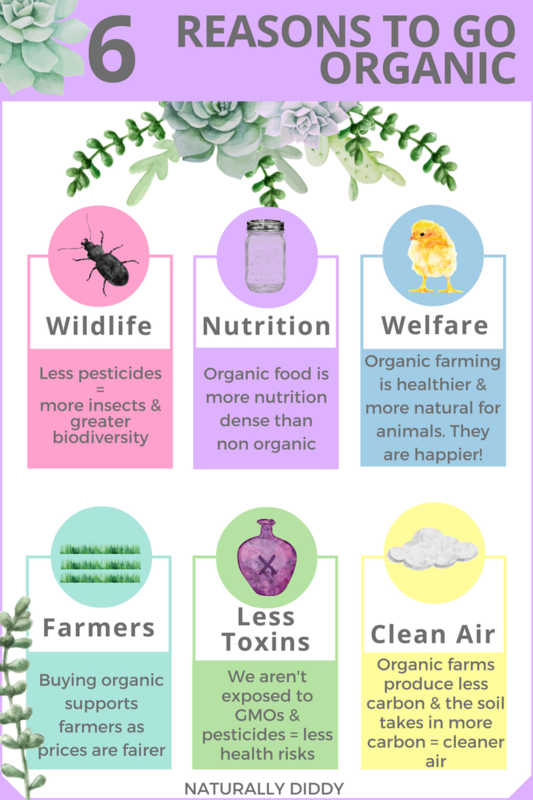 Now I'm not overly keen on the word 'should', everyone is free to make their own minds up, but if you're thinking about it, here's six quick snippet reasons as to why you might want to 'go organic'. For more detail scroll down to below my infographic! Biodiversity is essential to the earth, everything relies on it, from the smallest microbes to the largest animals. Everything is one long complex food chain. Without insect diversity humans would have little of limited food or raw materials for non food essentials such as cotton and hemp etc. as insects are paramount in pollination of plants and crops. Some insects will only pollinate one type of plant, some insects eat insects that eat the plants. Some animals feed off the plants that these insect eating insects protect, some animals rely on eating the insects that eat the plants, humans eat both the plants and the animals, and heck even some of the insects too! Insects and animals and plants rely on humans as much as we rely on them. As the Disney classic The Lion King defines it- 'it's the circle of life, and it moves us all.' If diversity starts lessening and the circle gets smaller, things stop working the way they should and that is bad news for the whole globe. Did you know that in the United States some farmers have to hire out bees at great cost to pollinate their crops because the local population has been decimated and can't provide the natural service they would normally do? How crazy is that, and why do they have to do that- because of toxic 'fertilisers' and pesticides. Meanwhile, some studies have found that organic farms and fields contain more species of wild plants, insects, birds and other mammals than non-organic farms and fields. So the maths is pretty simple and straightforward. Now this is an area that can be a bit of a hot topic, but the evidence is growing that organic food is more nutritionally beneficial in some aspects than non organic. In one of the most recent studies this year a research study lead by Newcastle university found that organic food such as meat, milk and other dairy products contain approximately 50% more Omega-3 fatty acids than non organic meat, milk and dairy products (this is due to the higher levels of natural grass and clover organic cattle eat). Organic milk and dairy also contained 40% more CLA (conjugated linoleum acid) which is being researched for its health benefits. Similarly milk nd dairy was found to have slightly higher levels of Vitamin E, Zinc and Iron. In fruit and veg multiple studies have found that organic fruit and vegetables contain between 18% and 69% more antioxidants (polyphenols) than non organic equivalents. Oppositely it was found that organic produce contained 48% less toxic cadmium (a metal that is toxic to humans). Choosing organic is not just about humans, it's about animals (as well as wildlife) that we raise too. Under organic guidelines animals raised for meat production or animal by-product production have a much higher standard of care, health and life. They have more respect and appreciation and are acknowledge as being vital to our lives rather than simply considered a means to an end that is to be exploited. On organic farms cows (both beef and dairy) have to be raised outside. They may be house inside in the winter as long as the indoors space meets strict guidelines with space, hygiene etc. The time they spend indoors must never be more than 1/5 of their lifetime. They also must only be fed on organic, GMO free food, which has to compromise of 60% roughage, silage and/ or fodder (hay, straw, grass, fermented grass etc) and 40% concentrates (barley, oats, corn, soy etc). For calves they are left to naturally suckle and are only weaned when they are able to be sustained by solids such as those just mentioned, and never before 3 months for dairy cows and 9 months for beef cows. Milk production is also a lot less intensive. Other animals must also be raised under these same free range conditions and again must have a strictly GMO free diet comprised of both organically grown fodder to supplement their diet and organic free range grazing. This means that any pastures of fields they are in must also meet the organic standard. The use of hormones and animal cloning are also banned. Antibiotics must not be used regularly if at all. Other practices such as nose rings, tail docking (cutting), crating and large herds in pig farming are all banned under organic standards. Poultry/Fowl (chickens and turkeys) must also be free range and fed organic GMO free food. Beak clipping is banned as are cages. For sheep worming is limited and managed naturally and sheep dips are banned. Even fish farming has to adhere to similar guidelines. This is not often something that crops up as much as the other reasons, but that doesn't mean it's any less important. By using less chemicals, synthetic fertilisers and pesticides fro crops and in animal feed farmers themselves are less exposed to dangerous levels of these chemicals, lowering their health risks. Costs for organic produce, especially milk is much fairer at about 20-30% higher premium than non organic food. It is notoriously known that traditional dairy farmers are under increasing pressure to reduce costs and are suffering as a result. Organic farmers are paid a much fairer price that covers their cost inputs much more appropriately. Whether it's beauty products, textiles, food or water - undesirable chemicals seem to creep into just about every aspect of our lives, whether it's from our furniture to the paint we use for our bedroom. And while the amounts may be small, after a while and with such regularity they start to build up. They build up to the point where they are found in breast tissue and in the brain, in our blood stream and our excretions. Sometimes you see an outward reaction such as a rash or a cough, other times you would never know (but it doesn't mean it/they aren't there). Choosing organic products in all aspects of your life can help minimise your exposure to these undesirable chemicals by cutting out the pesticides and the chlorine and plastics etc and potentially help reduce the presence of illness and ailments, both physically and mentally. As mentioned before, organic food in several studies was found to be 48% lower in cadmium. Levels of pesticides in organic food are around only 32% compared to the high 75% in non-organic food. Similarly organic crops show only 10% pesticide residues, dramatically lower than non organic food. Not just clean air, but clean soil and clean water too! Agriculture accounts for about 14% of green house gases produced worldwide. Swapping to organic farming could lower the UK contribution by at least 23%! Organic farming could help save over 64 tonnes of carbon from cultivated land in the space of 20 years, that equates to taking over a million cars of the road! Chemical run off pollutes our waters for humans and animals alike, it can also cause some insects and weeds to become resistant and hard to control. Soil is crucial for all life on the planet, it helps filter the chemicals and reduce water pollution as well as obviously being he foundation for all our farming. Healthy soil also helps prevent erosion and flash floods. And of course it doesn't just stop there, but this has already turned into a mammoth post so I'll keep it to just this! Great post, I am sharing it on my social media!